Talk to Powder up ahead to get the lowdown on Cloud 9, your task here is to fix some machines powering an hourglass. Proceed down the ramp, kill the Large Angel Riptoc and pick up the Ice Breath Dragon Rune just to the left a little. Next glide across the gap directly infront. You will need to hover to get onto the platform, step into the whirlwind and once you get to the top turn quite far to the right and glide over to the platform with four unjoined pillars at each corner. Continue on to the other side of the platform and glide down to the next one, it's got a large machine on top, not unlike the cannons in Crop Circle Country. Once over there step into the whirlwind and then use your Electric Breath on the three little things on its side. It should then tilt up a bit and fire a red beam towards the large hourglass in the middle of the level. Once you've done that glide down towards the next platform, close to the start again. Go up the steps and then into the whirlwind here. A bit to the left of where you land a platform will move between this platform and above the very start, jump onboard and take a ride. Once on the outer rim of this go around and into the portal. Sparx as usual is giving out helpful advice for a simple way of completing the speedway. That's rings, stars, go-carts and then flying Riptocs. Simple really. Fly through the rings, once you get to the end of those flame the jumping stars as you go past them, make sure to dive downwards after the first to get the second. Once all eight of those stars are gone, bank to the right and head down to the rainbow racetrack where you can charge into the go-karts as they come towards you. Once you've killed all of them fly upwards and find the flightpath of the Bed Planes and fly into them flaming as you go. The race is fairly tame here, fly through five normally, then veer off a little to the right to fly through a star to burst through six and seven, keep going off course to hit another star, veer back to the left to fly through the eighth ring, a few rings later there's a star in a dip between two close together rings and then a large gap between rings. Here veer to the right and go through some pillars to find a star over the rainbow racetrack and speed through to the end of the lap. Repeat for the next two times around and you should make it. Back in Cloud 9 again you'll want to jump down back to where you originally started from, go down the ramp and go right and into the building. Follow this through to the left and along the path, past a Cupid Raptor, two Large Angel Riptocs and go further inside and along the corridor in there. At the end of the corridor you'll find a room with a large pool, make sure to collect the gems in the water here. Go to the left and go up along the platforms right around the room and to the top, head out into the open area. Go forwards and talk to the bear in the middle, Thimble will ask you to get his magic wand back from a thief. That's fair enough, you'll find the thief on the opposite side of the building to Thimble. Simply chase him down and either charge into him or flame him as you get close. Once you kill him pick up the wand and talk to Thimble again, he'll start the swirly behind him. Step into it. Glide down from here onto the platform just outside, keep going along the platforms up here to the left. There should be a yellow dragonfly flying around up here or on the rainbow. It's generally difficult to catch this one what with the many small platforms and having to go a distance if you fall off or if it flies back to the platforms when you glide to the rainbow. To help you can try directing it from the ground so that it a bit up the rainbow, then when you get up there you will be able to chase it along the rainbow and Bubble Breath it. Anyway, go up to the end of the rainbow and glide to the second of the Cloud 9 machines. Zap the three bits around it to get it working. Now glide back to the mainland again, through the exit on the far side of the swirly which a Storm Cloud is blocking. You guessed it, a corridor. At the end keep going past a Large Angel Riptoc and then jump down onto a little circle platform. Jump up to the next platform where you'll meet a Storm Cloud and a Cupid Raptor like directly on top of each other. Glide the gap to the right, you should make it but you might need a hover. There's a rather pointless moving platform between you and the next platform, just glide down to it and step into the whirlwind in the middle of it. Turn round to the left and use the moving platform there to get up to the third machine. From the front of the machine if you look forwards you should spot a green dragonfly jumping about on one of the four pillars ahead. Glide to the closest one and then to the one with the dragonfly on. From the opposite pillar from Sylvia you should be able to glide a long way down to the next platform, or you could take the moving platform between there and the whirlwind platform. Head into the corridor and immediately you'll meet a red dragonfly to chase after. Continue down the corridor and out past Zoe up a long stepped slope to where you'll meet Nimble. It's a simple task, simply walk through the 'portal', aim at the Storm Clouds over the water and fire. For the five clouds five super flames should do the trick. Once they're all gone talk to Nimble again. Take the hint and swim down through an underwater tunnel in the pool, not forgetting to collect the gems around the rim of course. On the other side you'll come across a slightly tricky bit of gliding to do. You'll need to glide from the just to the right of the exit of the pool to the next platform, hovering at the end of the jump. Zap the machine to finish off that task. If you're lucky a rather annoying flickering (epileptics beware, seriously, it's a rather stupid design) ball of energy should surround the hourglass and it will start turning. Usually though the game will have glitched and you won't get the snazzy effect, you'll still be able to claim the reward in a bit though. Glide to the next platform using the same kind of gliding as you used to get to this one. Cross the ramp and Danny will give you a dragonfly if you've managed to turn all of the machines on. Ignore the Return Home Portal (every level it's in a stupid place!) and go down the corridor in the bottom of the building ahead (not forgetting the gems to either side of the building). Once outside jump down onto a moving platform to yet another of those pillared platforms and gather the gems there. Turn around and go back up the moving platform and look at the wall, climb the ladder there and jump inside the clock tower. Flying around inside here you'll find a red dragonfly. Continue upwards through the room,up a ladder and to the left and then across some gears in the middle of the room to a portal on the opposite side. 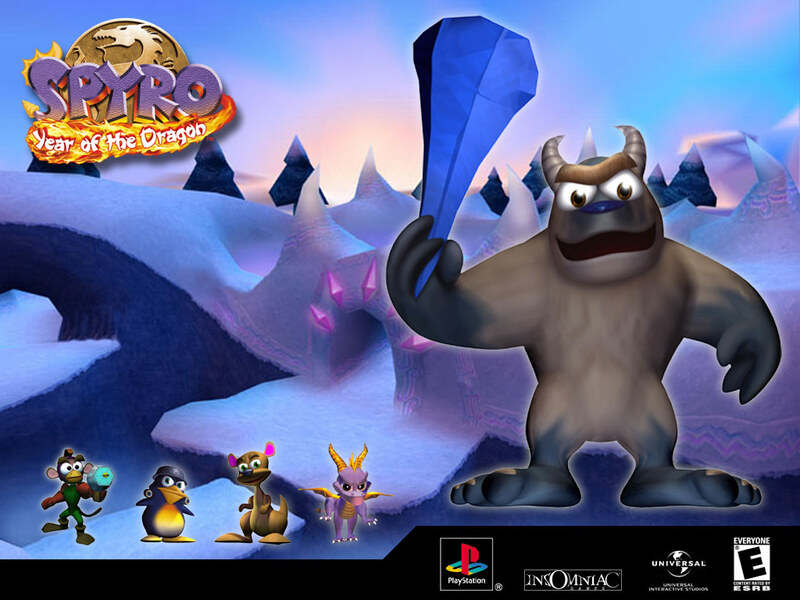 Pudgy (the voice changing bear) instructs you on the use of the spitfire, another new vehicle for Spyro. The trick in this mini-game is to circle the area endlessly, shooting a bit at each of the four battleships and trying to stay out of line of fire of the Bed Planes, running one down won't really work as they'll fire and hit you even if you do manage to kill them. Keep on circling damaging them bit by bit until you eventually win. If a Bed Plane looks like it could be a threat just bank to the left or right, whichever way you're circling. Oh, and tediously keep tapping the fire missile button. There is a time limit of some kind so you will need to try and hit the ships most of the time. Return to Cloud 9 to finish it off. Jump down to the entrance to the Clock Tower again and you should notice platforms to the left and right of the ladder you climbed. Jump onto the left one and go find the final dragonfly of the level. With that there's just one little thing left to do, if you've collected the right amount of gems you should be missing just 14 now. Those last few gems are nearby. Go over to the other side of the ladder now and to the corner of the Clock Tower facing the start of the level. Glide around the clouds to the right and land on top of the middle part of the entrance to where there is a pool. You should find the last 14 gems around the rim of this. Once you've got them all head back to the Dragon Realms, never to return again. A rather odd scene with Ripto will play out, probably just to remind you that Ripto is in the game or something. Oh I get it : ) Thanks to dark52, I can get all the gems now, this level is so random. Every time i attempt to do this level, i fail. Oh,found them!But,it's not a pool where the gem's are,it's on top of a roof with a hole on it. It says right there what it's an entrance to: "entrance to where there is a pool". The time trial and race make me go nuts!!!!! My cousin COULD help me on it, but he doesn't know about it!! And he's the one who owns the game!!!!!!!!!!!!!!!!!!!!!!!!!!!!!!!!!!!!!!! I barrow it. I have not even got the last couple of gems but I gave up on that game a year or two ago. Rainbow Speedway is in there too. I kinda thought this level was odd. *sigh* Guess I don't have a bond for this game.